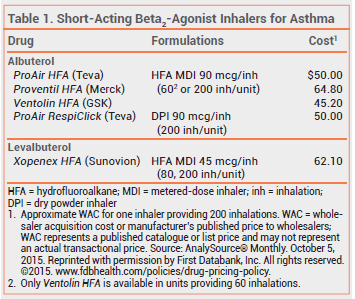 In Brief: A New Albuterol Inhaler (ProAir RespiClick) for Asthma | The Medical Letter, Inc.
Metered-dose inhalers (MDIs) use a hydrofluoroalkane (HFA) propellant. They require coordination of inhalation with actuation; using them with a valved holding chamber minimizes this need, but decreases portability because of the size of the chamber. Dry powder inhalers such as ProAir RespiClick, which are breath-actuated, do not require a propellant and do not have to be primed before use. They do not require coordination of inhalation with actuation, but patients must be capable of performing a rapid, deep inhalation, which might be difficult during a severe asthma attack. The recommended dose of ProAir RespiClick for treatment of bronchospasm is 2 inhalations, but 1 inhalation may be sufficient for some patients. The dose can be repeated every 4-6 hours as needed. For prevention of exercise-induced bronchospasm, the recommended dosage is 2 inhalations 15-30 minutes before exercise. Each ProAir RespiClick inhaler includes a dose counter. Opening the mouthpiece cap readies a dose for administration and causes the counter to count down by 1; closing the cap without inhaling the medication wastes that dose. The inhaler should be cleaned with a dry cloth as needed. ProAir RespiClick may contain trace levels of milk proteins; it is contraindicated for use in patients with a history of a severe hypersensitivity reaction to milk proteins.